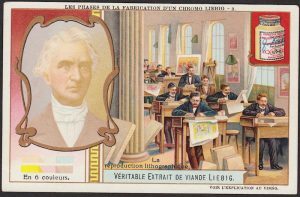 Liebig Card #3 from a set of 6 printed at the Turn-of-the-Century. 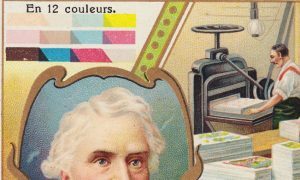 The card features a room full of copy artists working on stone “plates,” as well as a Liebig portrait as seen after the application of the first 6 colors… with 6 more colors of ink yet to be added via 6 more runs through the press. 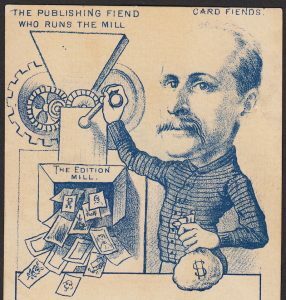 on a 12-ink press line in a distant major city, Victorians loved to collect advertising cards. 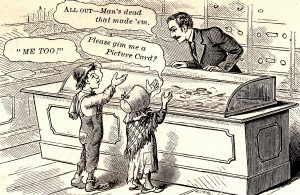 that they were described at times as down-right “fiendish” in their enthusiasms. So it is not surprising that a few cards were printed… about cards being printed. 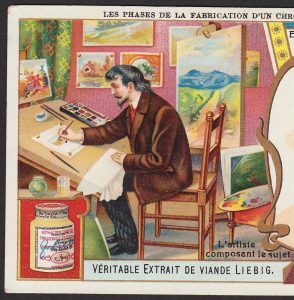 Just like today, some of the collectors back then were curious about how their cards were made. And because a picture is worth a thousand words, let’s see it. So here we ago: from then… for now. 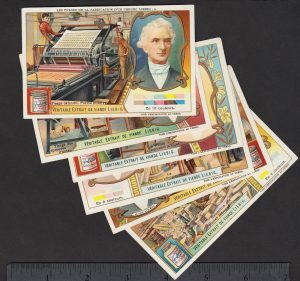 A set of 6 cards issued by Liebig, circa Turn-of-the-Century. 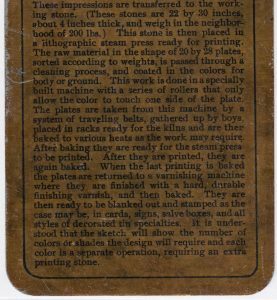 The second card in the set shows the limestone slabs being harvested from a quarry and cut to sizes for the stone press operations. 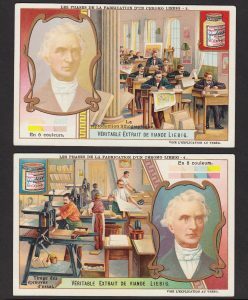 Burdick was noted for, among other things, manufacturing custom tin boxes with beautifully lithographed images. 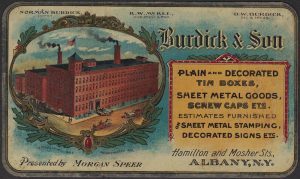 This card with a factory view of their Albany, New York, facility is a showcase of their work: the card itself is made of tin, and it demonstrated to potential clients the quality of the work they could expect when placing orders for “Decorated Tin Boxes” and lithographed signs, etc. 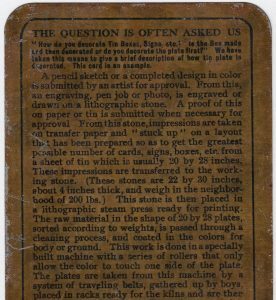 The reverse of the tin Burdick card answers the Question: “How do you decorate the Tin Boxes, Signs, etc.” The card text goes on to explain the chromolithograph printing process in helpful detail. 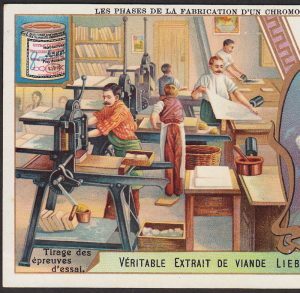 The metal Burdick card describes on back the work that is done with the lithographic stones, the inking process, and other aspects of chromolithographic image production. 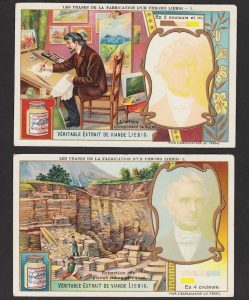 Cards 3 and 4 of the 6-card Liebig set illustrate artists and printers working with the stone slab “plates.” The word “lithograph” comes from the Greek language, and can be remembered loosely as: “litho” (stone) and “graph” (writing). 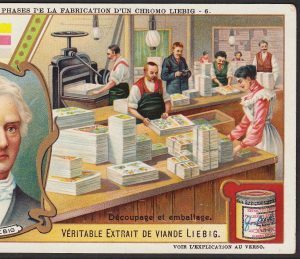 Card 4 of the Liebig set shows printers working with the stone slabs. Note vertical rows of the stones beneath the pres and on heavy distant shelves. 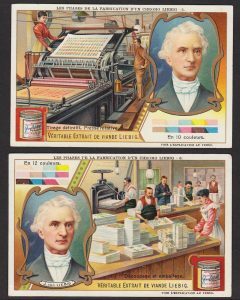 By the final two cards of the Liebig set, the portrait grows rich and realistic in subtle hues as 10, and the 12 colors are added. Only one color of ink is applied at a time, so to get the final portrait image, this card was imprinted 12 times; each imprint required a distinct stone. In addition to the 12 colors of ink applied to the card, note how additional shades are created where colors overlap. The cards come off the press in large sheets, so final step is the cutting and packaging of the cards.